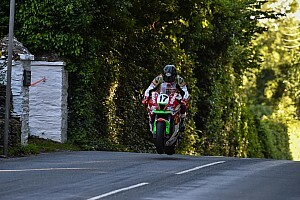 Wild race sees lead change as often as the weather! 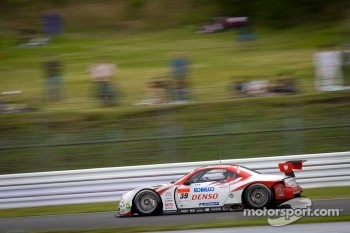 SC430 drivers Wakisaka and Ishiura take dramatic win. Hybrid Prius race car finishes 6th. 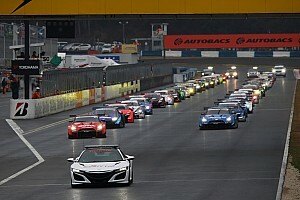 The FUJI GT 500KM RACE, Round 2 of the 2012 AUTOBACS SUPER GT series, took place at Fuji Speedway (one lap 4.563 km x 110 laps) in Shizuoka Pref. on May 4th. It rained on and off during the long 500-km race and through the difficult conditions it was the DENSO KOBELCO SC430 driven by Juichi Wakisaka and Hiroaki Ishiura that merged victorious in the GT500 class. With the veteran Wakisaka having come to the team this year, he has already helped them win their first GT victory in eight years. It feels great to be able to give the team a victory. Yesterday’s qualifying was competed in rather strong rain. By race morning the rain had stopped but shortly before the start it appeared that it might begin to fall again at any moment. All the teams started the race with fair-weather tires, but as feared, the rain did start to fall, bringing most of the cars back to the pit to change to rain tires by the third lap. As the race continued, rain fell intermittently, contributing to a series of spin-outs and crashes that kept the order changing time and again throughout the long 500-km race. Battling for the lead were the DENSO KOBELCO SC430 (Juichi Wakisaka/Hiroaki Ishiura), the CALSONIC IMPUL GT-R (J.P. de Oliveira/Tsugio Matsuda), the MOTUL AUTECH GT-R (Satoshi Motoyama/Michael Krumm) and the RAYBRIG HSV-010 (Takuya Izawa/Naoki Yamamoto). 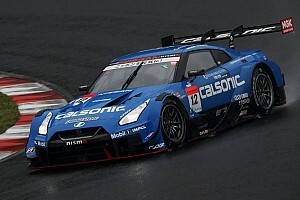 With 15 laps remaining in the race, De Oliveira was in the lead in the CALSONICIMPUL GT-R when rain began to fall again, causing him to return to the pit to change to rain tires. But, not enough rain fell to make the change worthwhile. This allowed the RAYBRIG HSV-010 (Izawa) to take the lead, but it turned out to be the DENSO KOBELCO SC430 (Ishiura) in 3rd position that had the best combination of machine and tire performance and driver technique. Charging hard, Ishiura took the lead with four laps remaining in the race and went on to victory. 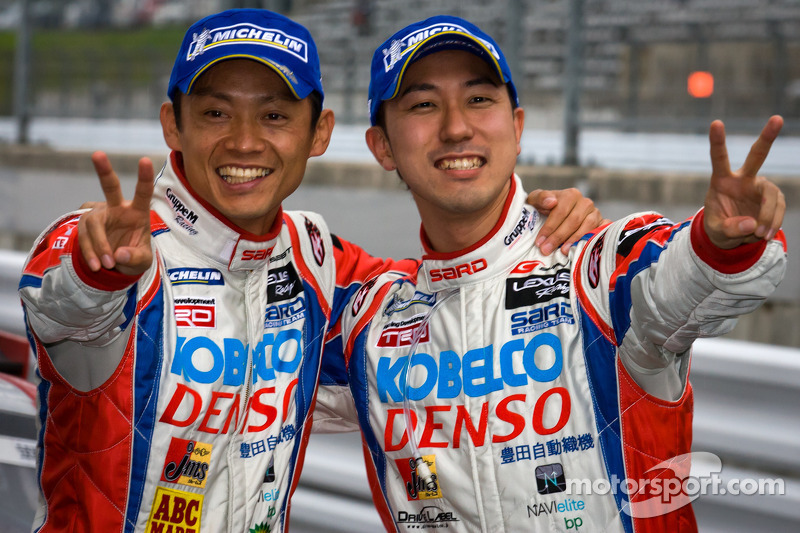 For the winning team, SARD, is one of the oldest and most established in Japanese motor sports. However, it had been unable to finish among the leaders in recent years, leading the management to sign drivers Ishiura last year and Wakisaka this year. 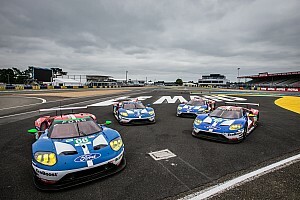 These moves paid off and has now brought the team its first GT victory in eight years and, with good fortune, it came on Toyota’ s home course. This is the second win in a row for the Lexus SC430, following the opening round victory at Okayama. 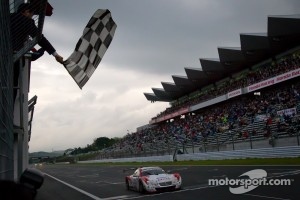 This was Wakisaka’s 11th career win in the GT500 class and Ishiura’s third. 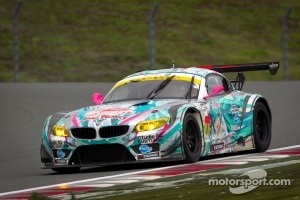 In the GT300 class, the GSR HATSUNEMIKU BMW (Nobuteru Taniguchi/Tatsuya Kataoka) started the race from 4th position and ran skillfully through the long and rough race—which included mishaps like being hit by other cars—to take the lead late in the race and run on to victory. From this season a Toyota Prius race car is competing in the GT300 class as the apr HASEPRO PRIUS GT. Of course it is a racing car mounting the same Prius hybrid system as in the production car, which has brought attention from people around the world. 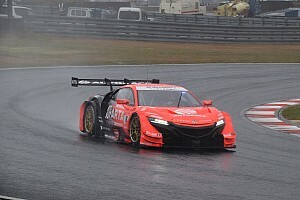 In its debut race in round one at Okayama , it unfortunately had to retire from the race, but in this round two it successfully completed the 500-km race. What’s more, it held its own against the famous European sports cars to finish the race in 6th place. After the race, the team’s ace driver, Morio Nitta commented: “This is a new challenge for a hybrid car, which until now has been difficult to prepare for motor sports. I am glad to be involved in this challenge and I am grateful to everyone who helped put me in this position. Everyone who has been working day and night to develop the motor and other parts of the machine were certainly waiting for this moment. But, this is only the beginning.” The leader of the development team, manager Hiroto Kaneso commented: “We have been able to get this far thanks to a lot of strong support and cooperation. I want us to be able to communicate the appeal of the hybrid to as many people as possible. I believe that is our mission. But, we still have six rungs to climb. To get there we will have to work hard.” Clearly he has his sights set on the top rung.